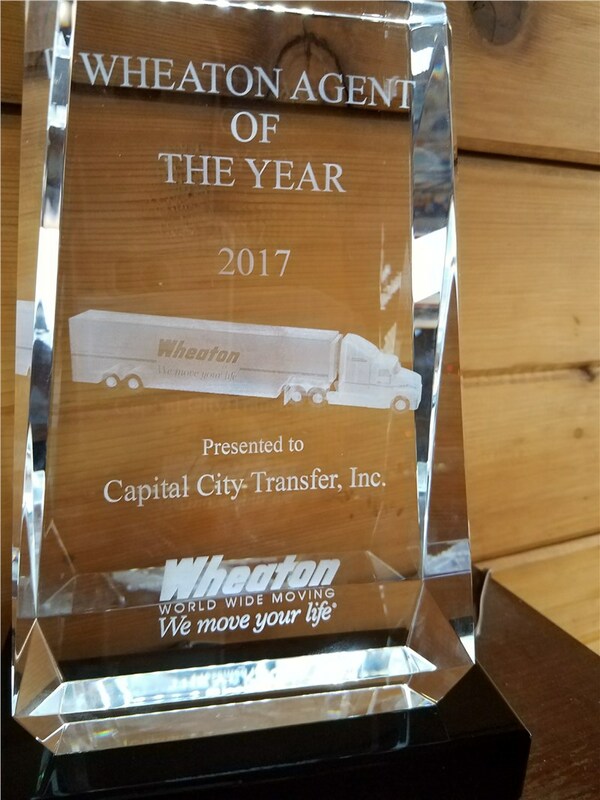 In the moving industry, few things are as prestigious as being affiliated with renown companies like Wheaton World Wide Moving—and even fewer still is the honor of being named, “Moving Agent of the Year!” Capital City Transfer is the proud recipient of the 2017 Wheaton World Wide Moving Agent of the Year award, an honor bestowed on those who exemplify customer-focused service founded on quality, professionalism, and empathy for customers, fellow agents, drivers, and Wheaton employees. Industry Expertise: Capital City Transfer became a Wheaton agent in 2009, and since we have earned multiple hauling and quality awards including five Agent of the Month awards. Attaining these awards along with the prestigious Mover of the Year award means that we put the needs of our customer first while providing industry-leading services including account managers, packers, loaders, warehouse specialists, and expert drivers. Established Reputation: Obtaining this award is largely based on our long-standing reputation and customer reviews. We are a leading choice for commercial and residential relocation in Wisconsin, and customers attest to the honest and customer-focused services we offer that often go above and beyond to ensure an exceptional moving experience. Wheaton World Wide Moving’s Mover of the Year award is only given to those who demonstrate a commitment to providing customers with a superior moving experience. This means staying on top of the latest and best moving trends, providing highest-quality moving resources, offering custom moving plans, and providing professional service that’s always efficient and courteous. If you’re looking for reliable Madison movers, this award proves that you can’t go wrong when working with Capital City Transfer! Contact our Madison Movers Today to Learn More! If you’d like to learn more about Wheaton World Wide Moving’s Mover of the Year award and how this benefits customers of Capital City Transfer, give us a call today to speak with a friendly moving specialist. We can also schedule your free, no-obligation consultation and estimate for your next residential or commercial relocation!